Our Amish Bow Spindle Bed is available in 5 different bed sizes. Ranging from a Twin to a California King size bed, you can be sure to find the perfect bed to fit inside of your bedroom suite. If you need a custom sized bed, we will do our best to accommodate you! 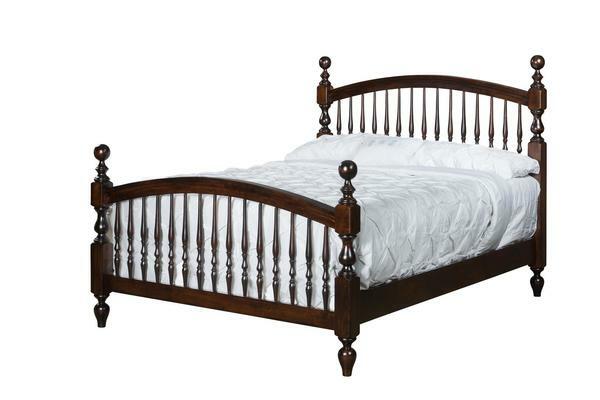 This Amish handcrafted bed is made to order out of your favorite solid wood and finish combination. This country style bed will help you create a peaceful and comforting place of rest in your bedroom suite. Since this handmade bed is crafted out of solid wood, you will be able to rest on a sturdy and comfortable bed for generations. If you have any questions about this bed or would like a custom quote request you may email us at Questions@DutchCrafters.com or give us a phone call at 866-272-6773. One of our Amish Furniture Specialists will be able to help you out throughout the whole process. Thank you for choosing DutchCrafters and we look forward to helping you out in the near future!